So excited to announce that Isabella Oliver have just launched their summer sale, with up to 50% off their maternity collection!! To be honest the whole maternity range is stunning and if you are like me you will want it all. However if the budget doesn't stretch quite that far don't worry, you can still buy more than you usually would be able to. The whole collection is in my shopping page so head on over and get purchasing before everything goes!! Wimbledon is now well under way, the sun is shining and summer is here. What better way to celebrate the sunshine and embrace your burgeoning baby bump than to invest in some new maternity clothes inspired by one of the hottest sporting events of the year? Jessica Alba and her husband Cash Warren attended a party at Mr Chows in Hollywood over the weekend and in typical yummy mummy pregnancy style, she looked radiant. She was dressed in a beautiful strapless blue maternity dress with intricate cutwork detail and a white shawl thrown over her shoulders. Jessica clearly is not one to let pregnancy deter her from wearing her favorite heels and teamed her outfit with some cute gold platforms. She was no doubt sitting down all evening so could easily get away with it! A new trend in footwear is taking the fashion world by storm; Flatforms, dubbed the shoe of the season! 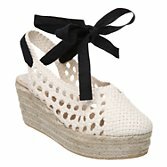 They have been described as a new hybrid of shoe combining the height of platforms with the comfort of flatties. This is perfect then for pregnancy! A shoe that still gives us a bit of height and glamour, without causing any crippling effects. Support comes from the likes of Chanel and Prada who at the spring summer shows described them as 'marvelously clever'. So if they are good enough for the top designers they are definitely good enough for us! Its the beginning of that wonderful time of the year.. summer sales! This maxi skirt is one of my favourites and is half price, only £15, it would be great teamed with a string vest for the summer weather that is supposed to be arriving next week! 20% Off everything including Maternity at New Look ! If you have been reading myblog, you might have seen how much I like the New Look maternity range. With such a wide range of items and being very well priced, its a winner at Mumzy-not. Now the maternity department at New Look fashion have just got in contact and provided me with a special 20% discount on their maternity range! I think it is really important to make time for yourself and allow a little bit of pampering at least a few times a month, this is even more so the case in pregnancy. Hormones and weight gain can get you down so its really important to do things that boost your mood and make you feel fabulous, even if it's only a little bit. One simple way to achieve this is to have your nails done! Alex Gerrard shows of the first glimpse of her baby bump this week whilst enjoying the sunshine in Portugal. The 28 year old wag looked glowing in a black frill bikini as she strutted her stuff on the beach. She is no doubt rather proud of her pregnancy figure and happy to show it off to the world. Why wouldn't you? Like i have said many a time before pregnancy should not mean you have to hide inside a frumpy old maternity one piece. How would you get a nice all over tan! ?